Checkout our exclusive edition of Mobile Combos and hopes for smiles and joy as you can avail two phones combined, at a much cooler price. 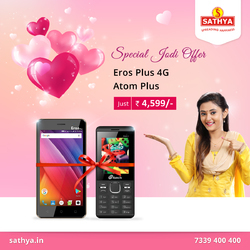 Buy Eros Plus 4G and Atom plus mobile at just Rs. 4,599/- Click for special prices & online shopping offers on mobiles. Fast Shipping & COD Options available across India!